The Great Debate: Should Forest Fires Ever Be Controlled? The Great Debate: Should Forest Fires Be Controlled? Forest fires are natural and necessary for forest health. But how much fire is too much? And when is fire suppression appropriate? Experts in favor of letting natural forest fires burn unchecked argue that fire suppression disrupts the natural forest cycle and endangers the livelihoods of people who depend on the forest, and the wellbeing of the plants and animals living there. Advocates for controlling forest fires note that unchecked flames often result in property damage, injury and even death, making fire suppression essential. The debate came to the forefront recently as areas of the United States and Canada have been devastated by forest fires. California’s Thomas Fire is now 100 percent controlled, and has become the largest and most destructive wildfire in the state’s history. The fire burned nearly 282,000 acres of Southern California and destroyed more than 1,000 buildings. It is responsible for at least one death. The fire, which stripped hillsides of vegetation, also was a factor in the devastating January 9 mudslides, which are responsible for at least 17 deaths in Santa Barbara County, California (as of January 12). Across North America, hundreds of thousands of citizens have faced similar catastrophic forest fires that have cost billions of dollars to combat. British Columbia made history after nearly 3 million acres burned (as of November 30, 2017), the largest total area affected in one season; the more than 1,300 wildfires forced the evacuation of more than 65,000 residents. Significant fires also hit Colorado, Oregon, Washington and Montana. Should We Intentionally Set Forest Fires? With all the natural, financial and personal costs associated with these recent forest fires, does it ever make sense to set them intentionally, even in a controlled environment? And if a fire breaks out naturally, should we allow it to burn unchecked? These are complex questions with many compelling answers. That is the reason some in the forest products industry, including Domtar, are proponents of using controlled burns as a tool to help to prevent large, catastrophic fires, while also keeping forests in balance. Although not a cure-all, the benefits of controlled fires have long been documented and promoted for good forest management. For example, according to the U.S. Forest Service, setting small fires or allowing low-intensity, natural forest fires to burn unencumbered helps clear the dead trees and underbrush that, left untended, become fuel for large-scale fires. Controlled burns can minimize insects and disease and improve the habitat for threatened and endangered animal species. 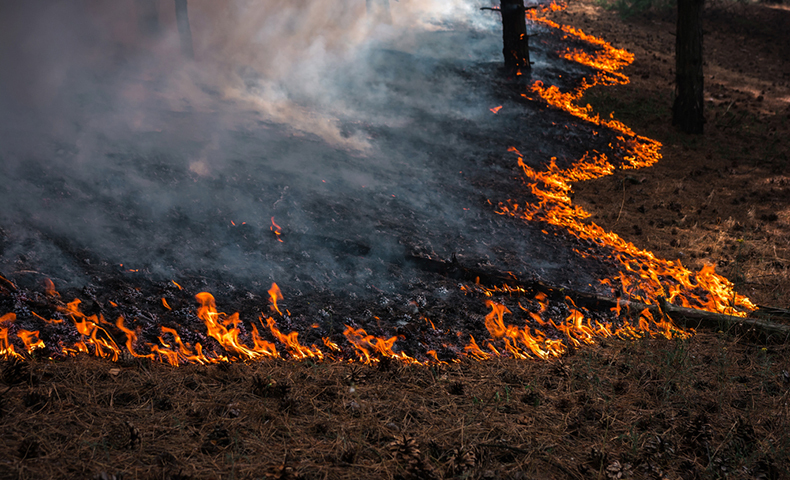 Prescribed burns provide key nutrients to soil, which help trees and vegetation flourish. These controlled forest fires also open up the tree canopy to allow sunlight into the forest. All of these benefits are important to supporting wildlife, some of which are well-adapted to living on burned land. “Controlled burns mimic nature and help reduce monocultures so that forests can become thriving ecosystems filled with a variety of plants, animals and insects,” says Belanger. Despite best intentions and thoughtful management, large, unchecked forest fires are always possible, regardless of whether prescribed burning was used preemptively. And occasionally those fires will become uncontrollable, as they did in California and British Columbia. When this happens, people often have no choice but to evacuate and let nature take its course.